ELIGIBILITY: Open to U.S. residents age 18 years or older, eligible to own a rifle. Employees of Old Glory Gun Safe Company (“Sponsor”) and immediate family members (spouses and siblings, children and parents and their spouses) or members of the same households (related or not) of such individuals are not eligible. Void where prohibited. 2. TO ENTER:Old Glory Gun Safes Ultimate AR-15 Giveaway begins at 12:00 AM Eastern Time (“ET”) on September 15, 2019 and ends at 11:59 PM ET on October 15, 2019. To enter, go to: http://www.oldglorygunsafes.com/gun-safe-contest.html and access the Giveaway Registration Form. Complete the required information on the Registration Form and submit, in accordance with the instructions, prior to 11:59 PM ET on October 15, 2018. Winner will be announced 3-7 days after completion of the sweepstakes. Limit one online entry per person. No purchase or donation is necessary to enter the Giveaway. Multiple entries will void your entry altogether. One entry per household. Do not repost this giveaway on social media or blogs without permission from Old Glory Gun Safe Company. 3. PRIZE/ODDS OF WINNING: On or about October 15, 2019 representatives of the Sponsor will conduct a random drawing from among all eligible entries received to award a Grand Prize consisting of: Firearms AR-15 Gift Certificate valued at $1,288. Promotional graphics do not necessarily represent the actual prize. 4. TRANSFER OF FIREARM: Transfer of the gift certificate, to be selected by the sponsor and agreed to by the winner. All laws for transfer of firearms must be followed. Sponsor will pay for reasonable shipping expenses. The winner is responsible for all taxes, transfer fees, FFL fees, and other expenses. The Transfer shall be conducted through a federally-licensed Federal Firearms License (FFL) dealer. All firearms transfers will be conducted in strict compliance with all applicable federal, state and local laws. By entering this sweepstakes you acknowledge that you are not legally prohibited from owning or taking possession of firearms. If the transfer of the firearm to you is legally prohibited for any reason, another drawing will be held and another winner will be selected by another random drawing. By participating, entrants agree [a] to these rules and decisions of Sponsor and judges, which shall be final in all respects relating to this giveaway; and [b] to release, discharge and hold harmless Sponsor and its agents from any and all injuries, liability, losses and damages of any kind resulting from their participating in the Sweepstakes or their acceptance, use or misuse of a prize including, without limitation, personal injury, death and property damage; and if a winner, [c] to permit Sponsor to use his or her name, photograph, likeness, statements, biographical information, voice, voice likeness and city and state address for advertising, publicity and promotional purposes in all media, including but not limited to on air and online, in perpetuity, without compensation (unless prohibited by law) and agree to execute specific consent to such use upon request. Sponsor and its agents are not responsible for and shall not be liable for: [a] electronic, hardware or software program, network, Internet, computer or other technical malfunctions, failures, or difficulties of any kind, including without limitation, server malfunction or by any human error which may occur in the collection, processing and transmission of data; [b] lost, late, misdirected, illegible or incomplete entries or postage-due mail; [c] any type of graphical or other error in the advertising or printing of the Sweepstakes or in the administration of the Sweepstakes; or [d] any condition that may cause the administration, security or proper play of the Sweepstakes to be disrupted or corrupted; and in such event Sponsor reserves the right in its sole discretion to cancel or suspend the Sweepstakes or any portion thereof and to award the prize(s) via a random drawing from among all eligible entries legitimately received prior to cancellation. Entry information becomes property of Sponsor. Internet entry must be made at the authorized Web site address. In the event of a dispute regarding the identity of the person submitting an online entry, the entry will be deemed to be submitted by the person in whose name the e-mail account is registered at the time of entry. Potential winner may be required to provide evidence that winner is the authorized account holder of the e-mail address associated with the winning entry. Sponsor's decisions are final and binding. In the event that the Sponsor is not able to contact the randomly-chosen winner after due diligence (two emails and one telephone call, if telephone number provided) and a time period of 7 days from the date of the drawing, the Sponsor may draw a new winner and the first winner forfeits all claims to the prize and/or damages and holds Sponsor blameless. It is the responsibility of entrants to provide a valid e-mail address so Sponsor can make contact. Sponsor’s promotional partners and other parties grant Sponsor, its promotional partners and other third parties with whom Sponsor chooses to share entrants information, permission to contact entrants about upcoming promotions, special offers or for other reasons via electronic and ordinary mail. 6. WINNER LIST: To receive a winner list, mail a self-addressed, stamped envelope to be received by March 31, 2019, to Old Glory Gun safe Company, 3407 S Jefferson, Suite 64, St. Louis, MO 63118..
7. 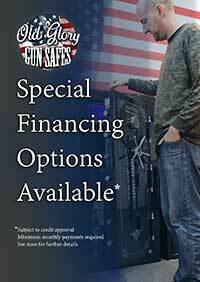 SPONSOR: Old Glory Gun safe Company, 3407 S Jefferson, Suite 64, St. Louis, MO 63118.